This review and synthesis paper examines how the process of bioerosion, the breakdown of hard substrata by organisms, affects the structure and biodiversity in ecosystems and the socioeconomics of human systems. Then it predicts how this process is exacerbated or mitigated by human impacts. Many different organisms from bacteria to elephants bioerode substrata and this widespread process occurs all over the world from the deep ocean to the tallest mountains. For example, bioeroders, such as sea urchins, breakdown coral reef or rock to create pits to live in, erosive crabs and rodents create burrows in marsh banks and levees, while others such as lichens may dissolve and grow into stone used in monuments and statues. Thus, this process can have large scale (and sometimes destructive) impacts to ecosystems and human-made infrastructure (such as docks and buildings). Several human impacts, such as climate change, introductions of invasive species, and nutrient pollution are affecting bioerosion, which in turn can influence how these changes alter ecosystems and human infrastructure. However, these interactions are complex and interactive, and in many cases, we still do not have a strong understanding of how these human changes will influence bioerosion and future communities. Future work is needed to fully understand how bioerosion will be altered in an increasingly human-dominated world. Oct 5, 2017. The College of Natural Sciences and Mathematics hosted another successful Undergraduate Research Reception at Sacramento State last week. Over 50 Undergraduate researchers from Astronomy to Biology presented their research posters including lab member, Ethan Roberts. During the summer 2017, Ethan worked with Dr. Davidson through the SURE program to conduct novel marine ecology research. 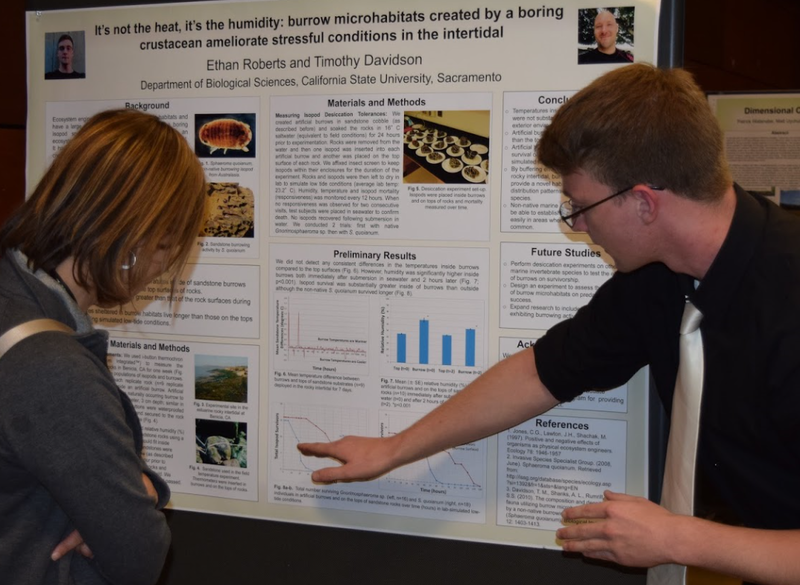 Ethan investigated how burrow shelters made by an invasive isopod, Sphaeroma quoianum, creates a buffered microclimate for other intertidal organisms. Burrows produced a more humid microclimate, which reduced desiccation stress experienced by intertidal crustaceans. This research will help us better understand how habitat-modifying species can affect patterns of abundance and diversity of other marine organisms. Dr. Suchanek has over 100 peer-reviewed publications and professional reports and his research addresses critical questions in marine ecology, the impacts of environmental contaminants (such as mercury) in the aquatic environment, and the impacts of climate change. Cost: $5 for students, $10 in advance, $15 at the door. Multiple internships in California through COAST for summer 2017. Applications due March 6, 2017.